Product Description Work of Art. The well-designed, well-crafted furniture in our Mosaic collection shows off a tile-like motif that reflects its name, while providing superior function. Each piece features dark brown veneers and the case goods boast oval, brushed nickel drawer pulls for modern flair. The grid-like, square tile pattern is present in the bed's headboard and footboard, as well as in the frame of the beveled mirror. 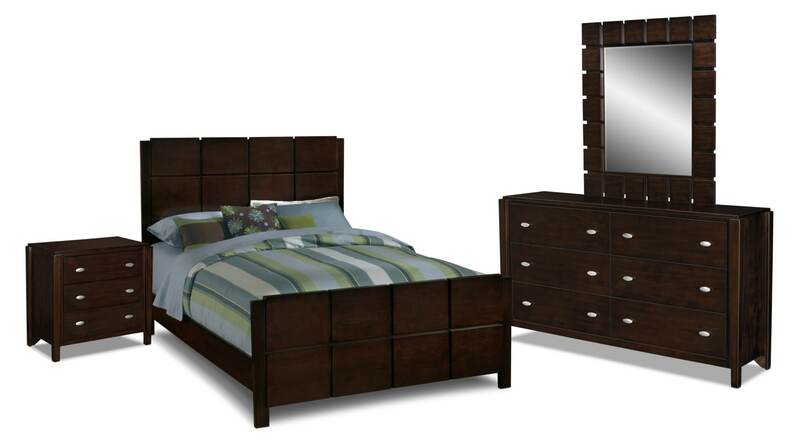 Six piece package includes complete Queen bed, dresser, mirror and nightstand, as shown. Unique Features: Unique block pattern adds to the rich, contemporary style. The tapered leg treatment accentuates the modern aesthetic. Beveled edges on the mirror indicate the attention to quality details. Brushed steel oval drawer pulls complete the on-trend look. A dark finish throughout enhances the contemporary design. Case goods offer adjustable levelers on front feet and floor glides on back for easy moving and adjusting. Construction: Quality construction of solid Asian hardwoods and veneers over engineered wood provides strength and durability. Drawers: Nightstand has three drawers, including a cedar-lined bottom drawer. Dresser has six drawers, including a cedar-lined bottom drawer. French dovetail joinery on drawer fronts and English dovetail joinery on drawer backs indicate quality construction. TV chest has six drawers and includes one removable CD tray in the right bottom drawer, one removable DVD tray in the left bottom drawer, and full extension guides for the two bottom drawers. Chest has five drawers, including a cedar-lined bottom drawer. Accommodations: TV chest accommodates most flat-panel TVs up to 50 inches.